This game is not just for a butterfly theme. You can use any topic that works for your kids. In fact, I have plans to do it again in a couple of weeks for D is for Dinosaur! What I can tell you is that 3 and 4 year olds love it as much as an Easter Egg Hunt! This game was a spur-of-the-moment replacement for our motion time. The weather was rainy so going outdoors was not possible. I wanted to get my kids out of the classroom into a different environment but the gymnasium was occupied, too. So, I used this as an opportunity for a mini-adventure and a way to help them to get to know their classmates a tiny bit better. First, our preschool theme that day was B is for Butterfly. I had pre-purchased a pack of butterfly pictures from the Dollar Tree, not knowing exactly what I’d do with them but, hey, they were $1! (They also had dinosaurs, so I have a pack stashed away for Letter D week!) There are 36 pictures to a pack and I have 12 students. Perfect. 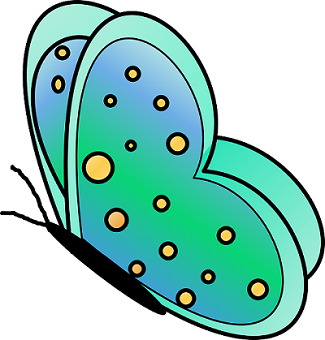 Note: if you cannot locate them, print out butterfly pictures using free clipart online. Small photos of the children, printed on cardstock and cut out. Print photos of the students onto cardstock — one of each — and glue them to the back of 12 of the butterflies. The rest remain blank. Have someone spread the butterflies around a large area. We used the school foyer for our game. I prepared my students that, if a friend couldn’t find any, the good thing to do was to help their friends. No need, though. Everyone found some! Did you read about the exciting B is for Butterfly day we had? This game was just a small part of a very big day. Children love to play dress-up. The best dress-up clothes for imaginative play are top quality, look great, soft to the touch inside and out, easy for a child to put on and take off all by themselves and machine WASHABLE! Thought that wasn’t possible? These little kid costumes do exist! #affiliate Check out the adorable dress ups at Little Adventures. Tip: They make excellent gifts.